Acton Town is actually quite a complex area, with a siding to the west of the station and three sidings to the east. 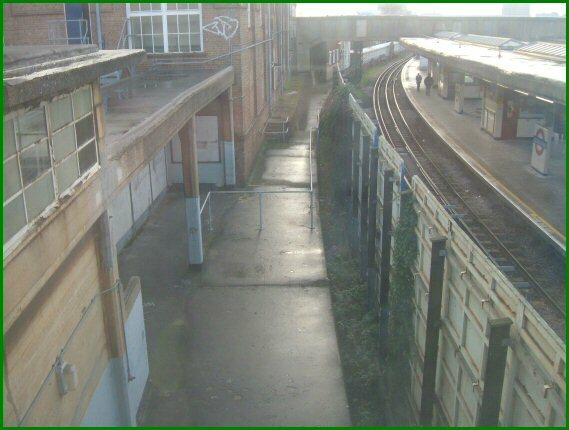 Additionally there are two sidings visible from the westbound 'local' platform - these are only used in connection with moves in and out of Acton works, and are now rarely used. Access to Acton Works is also available from the westbound 'local' platform. Shunt moves can also be made from the westbound 'fast' platform to the east sidings, but these are not made by District Line trains. To cover everything in the area I need to include two signal diagrams, one covers the station and the area to the west of it, the other covers the sidings to the east. The first view is taken from the staff footbridge at the east end of the platforms. In this picture two Piccadilly Line trains can be seen; the one on the right is approaching the station, the one on the left is stabled on 21 Road. This gives a good impression of how far out of the station these sidings are. 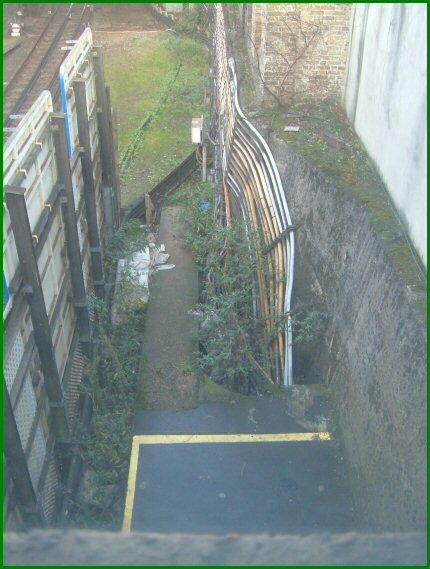 Although the District Line can use any of the three sidings, it will normally use 21 Road; this is the only siding that has access back to our 'normal' westbound platform. As will be seen later, it is possible for District line trains to be routed back to our normal path - this would occur on the trip towards Ealing Common. 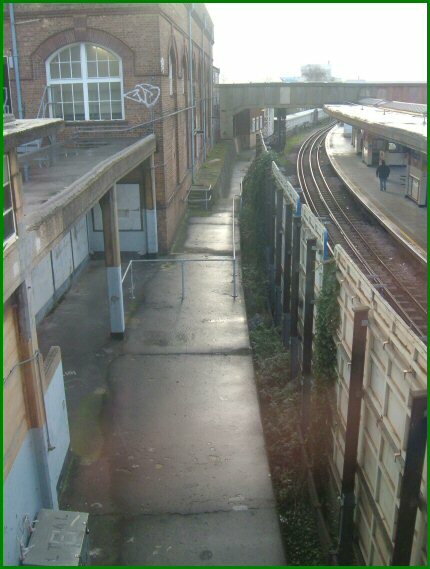 The two tracks visible to the left are the sidings which give access to Acton Works; even in this small picture the appearance of the rails gives a good indication as to how rarely these are now used. The entry to Acton Works (and the works itself) can also be seen. The pointwork to and from the works to the westbound 'local' can also be seen, again now infrequently used. This picture was taken from the east sidings, looking back towards Acton Town station - the white painted footbridge visible is from where the previous photograph was taken. The building to the right is Bollo House, the west end 'home' of the Piccadilly Line. This occupies land on which the District's old South Acton shuttle service used to run. Taken from the same place, but facing towards the east. The 73 Tube Stock train stabled is on 21 Road, and is the train visible in the first picture above. Platform 5 at Acton Town is from where, between 1932 and its closure on 2nd March 1959, the shuttle service between Acton Town and South Acton operated. In Piers Connor's book 'Going Green' there are photographs of both South Acton station and of a train standing at Platform 5 at Acton Town on page 66. Platform 5 still exists, although hidden behind the hoarding visible from Platform 4, the eastbound 'local' platform. The following photos were taken looking down on the platform from the walkway over the eastbound local road and - if compared with the photo in Pier Connor's book - little has changed. At some point I hope to gain the indulgence of the station staff at Acton Town to let me down onto the old platform for a chance to get a couple of pictures from that level. This photo is looking towards the west, and the ramp down to track level is still clearly visible. The grassy area in the top centre is where the sand drag used to be, as seen in Piers Connor's book. This photo is the view looking towards the east, The structure to the left is the stairs down to the platform, which itself is still in remarkably good condition. Although very similar to the previous picture, this makes it a little easier to imagine how the now removed track was aligned. It ran towards South Acton on the land which is now occupied by Bollo House, the covered walkway to which is visible to the left of the eastbound track visible here, then curving left towards South Acton station which of course still exists today.